What a strange and, in musical terms, a somewhat beautiful journey the Cameroonian Moken Nunga has made. From his coastal hometown Victoria, now called Limbe, in Africa’s Cameroon to Detroit, Michigan and now onto his first musical offering. In Detroit, with the help of his American father, the young man attended design college at the College of Creative Studies and after his share of hardships he ultimately prevailed and graduated, a lifelong ambition. Along the way the talented storyteller was able assimilate some life experiences that, while at times challenging, never dampened his generally upbeat spirit. The result is a wonderfully vivid musical accounting Chapters of My Life his debut cd on Atlanta’s Bantu records. This slender almost spindly man has a captivating voice that ranges from bellowing baritone to piercing falsetto. His modulating delivery is somewhat reminiscent of the Avant- garde sound of jazz singer Leon Thomas, although it is more warbling than Thomas’s yodel style. He speaks of being influenced by Van Morrison and Nina Simone, and attributes some influence to the jazz funk, Cameroonian saxophonist Manu Dibango, famous for his hit song “Soul Makoosa.” I can hear some Bob Marley in him also. Simply put Moken possesses a very real World sound, a fiercely original sound that has an almost universal appeal made particularly compelling by the man’s unforgettable voice. From the opening bars of his “Wild Wild Ways” you are swept up in Moken’s musical personae. He has an easy lilting manner in his delivery, with infectious beats and soothing rhythms that simply draw you in. His vocals are mesmerizing and the music is hypnotic with guitar work by Pascal Danae and fellow Cameroonian Blick Bassy. The rhythm section is made up of Jean Lamoot on bass and Baptiste Brondy on drums, with overdubbed background vocals by Moken himself, Bassy and Roselyne Belinga. Together the album is non stop groove. “Malinga” is a compelling repeated vamp over a rolling rhythmic groove. Moken’s warbling voice is joyful celebration of song and the background vocals just add to the chant-like call. Moken certainly demonstrates his sense of humor with his playful lyrics on “A Bone to Grind with Einstein” where he humorously suggests that the famous mathematician stole his look, his hair and his mustache. The infectious rhythm of “A Bato Bam” proclaims “we are all travelers in this world,” sung as a vocal background chant as Moken musically speaks about the struggles of human existence and how we all must travel through our lives with courage. In a proclamation of his own struggle to achieve, Moken offers the haunting “The Man Who Never Gives Up.” The depth of his melodious baritone is featured on the Sengalese sourced mbalax-inspired “Ma Masse.” With his quirky vocals modulating between the deep timbre of his speaking voice and a falsetto cry he employs, we are introduced into the mechanistically driven “Machine Man” the most futuristic of his offerings. Starting with a simple finger picked guitar and splashing cymbals Moken’s quivering voice exclaims how easy it was for him to have become a machine in his actions despite having the heart of a human being. Brondy’s syncopated beat is introduced, creating an automated feel as an electric guitar screeches in distorted defiance. 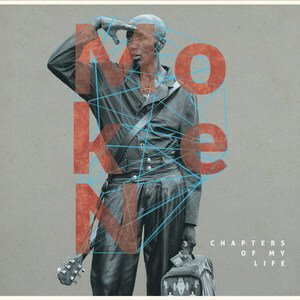 One of the most memorable melodies that Moken creates on this album is surely his musical “Walking Man” an autobiographical reference to his own travails, where he found himself car-less, walking everywhere, at times to near exhaustion. With the catchy repeated refrain “Homeless, food-less, shoe-less, sleepless, careless,” he commands his more fortunate brethren to never look down on the walking man, for as Moken discovered himself, the walking man might well one day be you. At his best Moken is a melodic troubadour who tells his compelling story with a rhythmic vamp and a most unusual voice. “Jerusalem” opens with a gentle acoustic guitar refrain before going into a classic African inspired rhythmic vamp with its finger picked guitar lines that remind me of some of Lionel Loueke’s work. Some inspired vocal choral work singing the title “Jerusalem” frames Moken’s own exploratory vocals. The words are not always easy to distinguish for me, but the voice is so compelling and the rhythms so moving that you don’t really need to know what he is saying to enjoy the music. The finale is “Waiting for the Day” a cheerful romp that declares everyone will have their day and that it is worth waiting for. There is a sixties rock sensibility to this one, sounding vaguely like Traffic’s “Light Up and Leave Me Alone,” but no one would confuse Moken’s strange falsetto with Jim Capaldi’s rasp. Moken Nunga has reportedly moved to Atlanta where he hopes to pursue his predilection to creative design. He hopes to employ his skills with leather and cloth and open a shoe atelier. With such a promising debut album we can only hope that this artist has more chapters of his life to share. You can sample this album by clicking here.